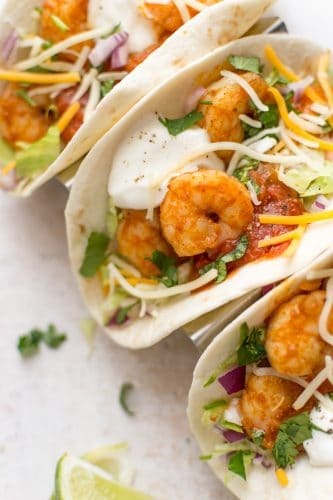 Easy Shrimp Tacos are the perfect simple dinner for busy weeknights! 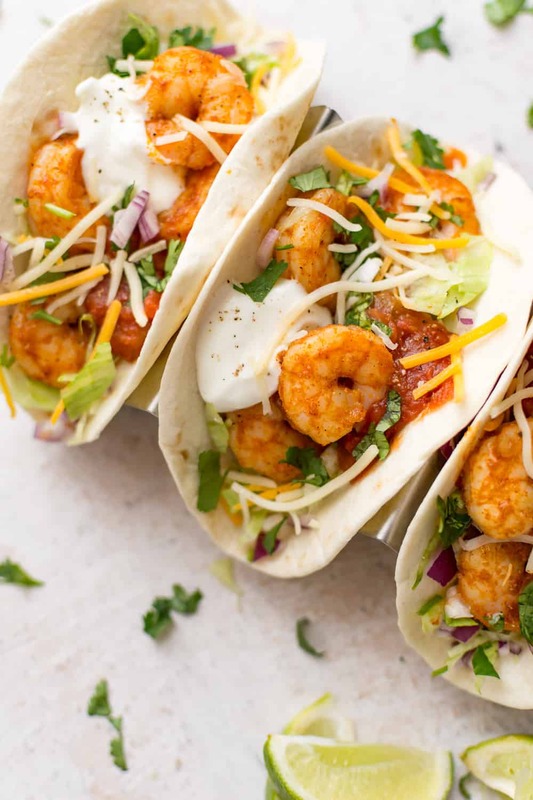 Plump, juicy shrimp are cooked in a flavorful spice blend then wrapped in warm flour tortillas and piled high with your favorite toppings. 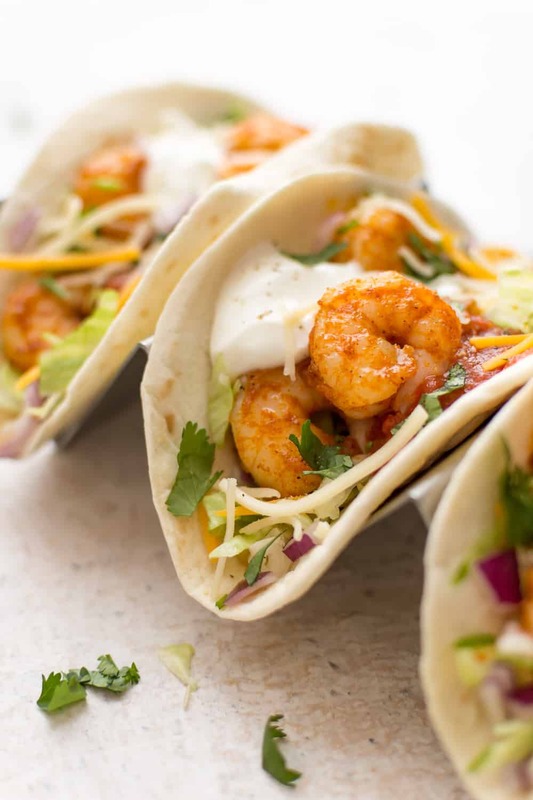 You may also like these grilled BBQ Chicken Tacos, Breakfast Tacos, Baked Chicken Tacos, Spicy Blackened Salmon Tacos, these Smoky Fish Tacos with Apple Slaw, or try The Best Homemade Taco Seasoning. Hi! It’s Natasha from Salt & Lavender bringing you another easy and delicious dinner that’s a great timesaver for busy families! I love tacos. You just can’t go wrong with tacos in my opinion. Everyone will be happy because they can choose their own toppings, and tacos are fun to eat. This recipe is sure to be a hit! Prep your shrimp. Make sure they’re thawed if you’re using frozen shrimp (run them under cool water). Peel them and remove the tails too. Get everything ready. I like to start prepping the toppings while the shrimp are thawing. Chop your veggies and get the condiments (salsa, sour cream, etc.) ready. Cook the shrimp. This process doesn’t take long at all (about 5-6 minutes). 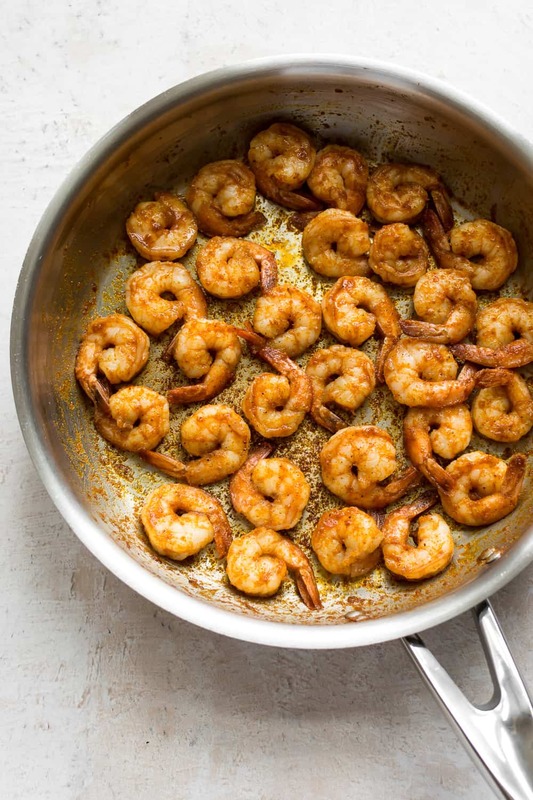 You simply cook the shrimp with the oil and spices until they’re pink and cooked throughout. Assemble your tacos. Time to load ’em up! Want to make these tacos spicy? Add a 1/2 teaspoon of cayenne pepper! I used flour tortillas in this recipe, but feel free to use corn tortillas if you prefer. To heat flour tortillas at once, I like to wrap them in foil and place them in a 375F oven while I’m getting everything ready. It’s also easy to warm tortillas individually in the microwave (just put one on a plate) by heating it for 10-15 seconds. I do this if I’m making tacos just for myself. If you’re in a rush, feel free to use pre-made taco seasoning instead of the spices I chose. I used 31-40/pound count frozen raw shrimp. You can use smaller or larger shrimp if you wish. Toppings (optional, to taste): sour cream, salsa, iceberg lettuce, tomatoes, cilantro, etc. Prep your shrimp. If frozen, run them under cool water until thawed. Peel them and remove the tails. Add the shrimp to a skillet along with the olive oil and spices. Cook over medium-high heat until the shrimp are no longer pink, flipping/stirring them occasionally (about 5-6 minutes). Assemble tacos as desired and serve immediately. You may use ready-made taco seasoning instead of the suggested spices if you wish. Add 1/2 teaspoon cayenne pepper if you want some heat. To warm flour tortillas all at once, wrap them in foil and warm in a 375F oven while you're getting everything else ready.